When her friend goes missing, Sophie finds herself and her father's bar thrust in the middle of a dangerous game of cloak and dagger. Can she trust this pirate, or will she and her father lose everything—life, love and liberty? Set in 1941, along the North Carolina coast, SHANGHAIED begins the story of Zach Edgars and Sophie Moore, characters who would eventually become the grandparents of Ferrell's present-day Edgars Family heroes and heroines. It's a story filled with emotion, intrigue, and ever-increasing suspense, much like the country itself was experiencing in those final days leading up to America's entry into what would become WWII. I was hooked from page one and my attention never wavered. Ferrell does an outstanding job of bringing the reader into this world with era-specific language and descriptions, atmospheric settings, and characters so vividly portrayed I found myself believing they had actually lived rather than being products of the author's imagination. Ferrell populates the story with a variety of nuanced characters, all brought to life via dialog and description and all contributing to the story, and to my emotions. I really felt as if I was right there with them the entire way. SHANGHAIED is the first of several books planned for this earlier generation and I am excited to read them all. Not only am I looking forward to more adventures with Sophie and Zach, but I'm hopeful we'll be seeing more of Zach's military undercover team as well. I want to know more about these brave young men and where life - and the war - takes them. 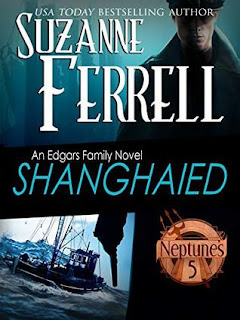 SHANGHAIED is a special treat for fans of Suzanne Ferrell's present-day Edgars Family series but stands well on its own as an introductory prequel for readers who have yet to discover these romantic suspense stories. It has my enthusiastic recommendation. Thanks so much, PJ! Glad you enjoyed Sophie and Zach's first adventure. I enjoy reading books before and during WWII. I am a history nut and WWII is a favorite era of mine. Thank you for this review and an introduction to a new to me author and series. This sounds like it will be an interesting and enjoyable read. Since I am a bit familiar with the area, it will be all the more enjoyable. I am glad to see more authors setting books prior to and during WWII. There are so many possibilities for good intrigue and romance stories. I need to stop reading your blog PJ because I keep finding new authors that write books I must read!! I love reading about history and this sounds like it fits the bill. Thanks for the recommendation!! I enjoy reading anything about WWII. I do enjoy her stories - thanks.